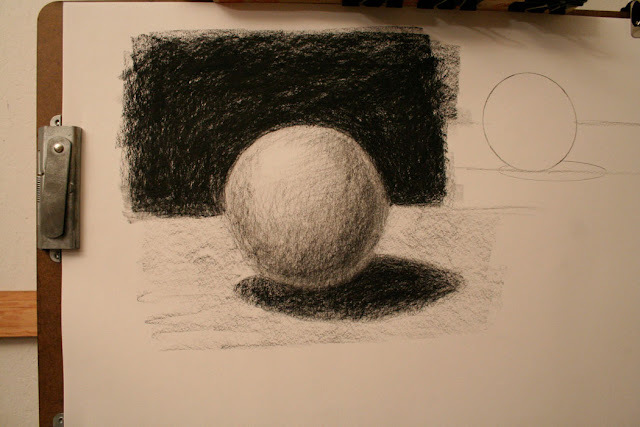 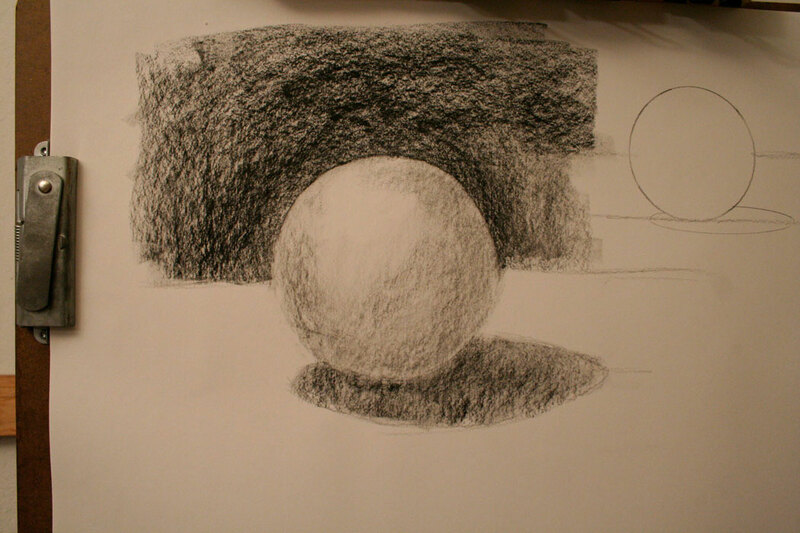 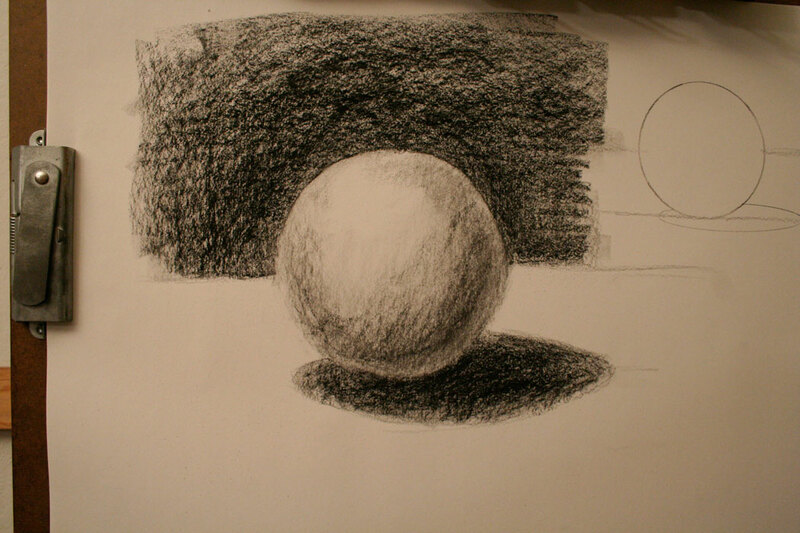 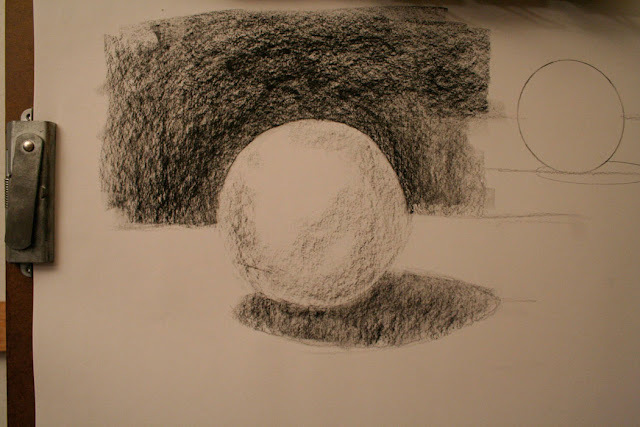 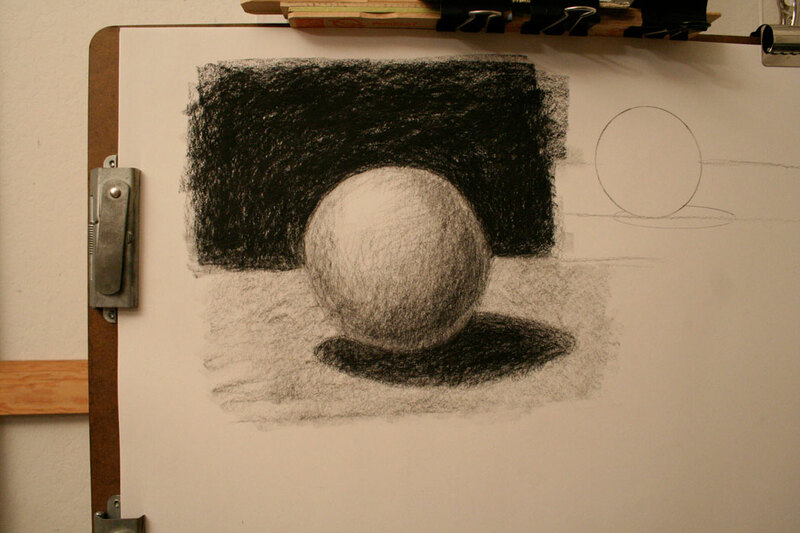 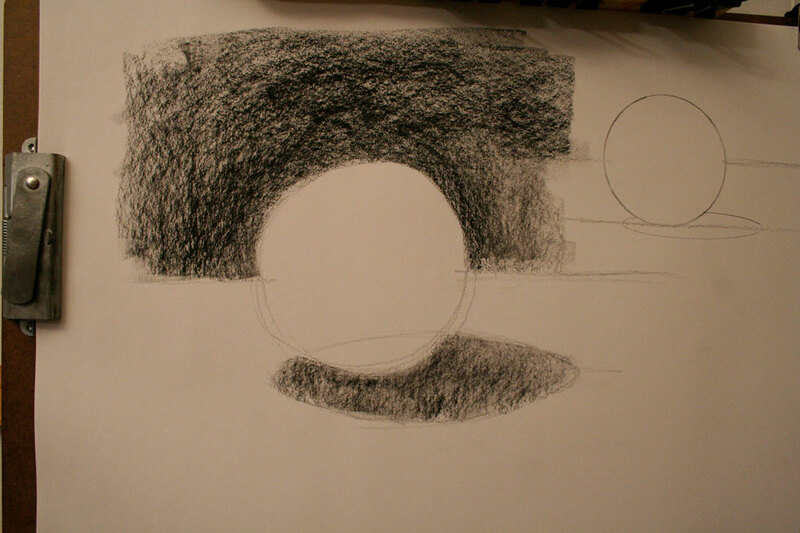 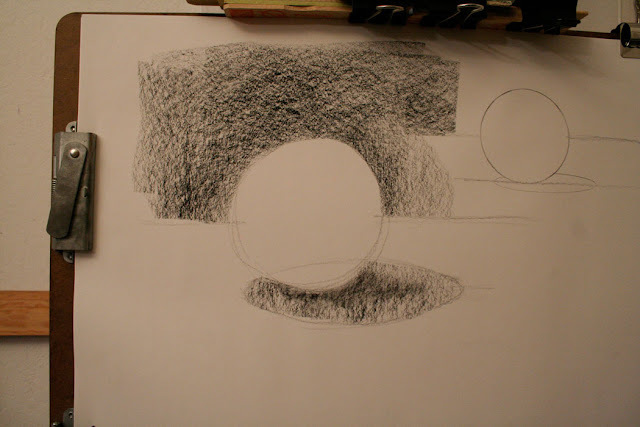 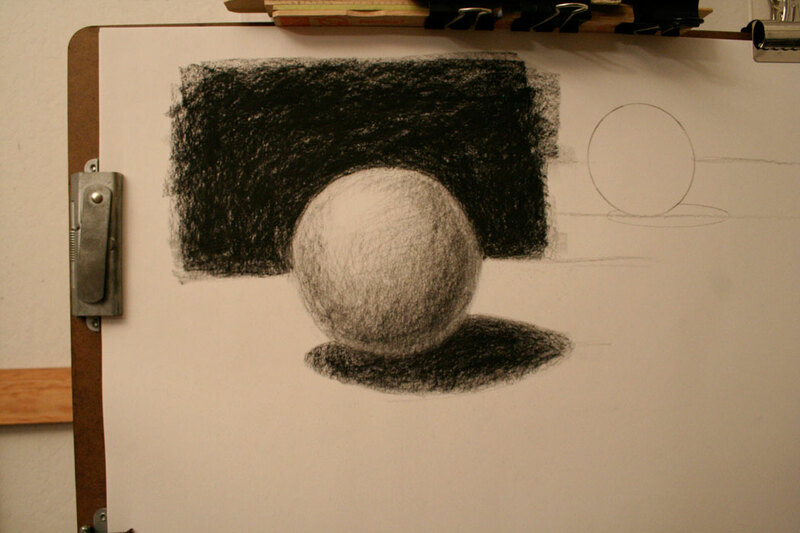 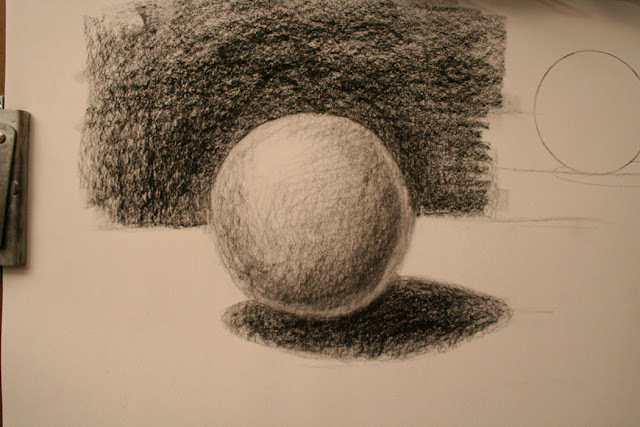 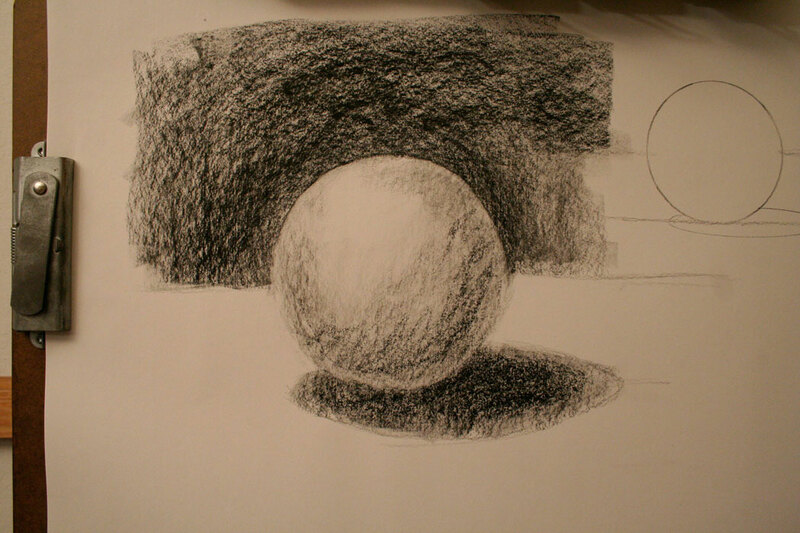 The sphere is the basis for a lot of shapes that you will have to draw and paint. 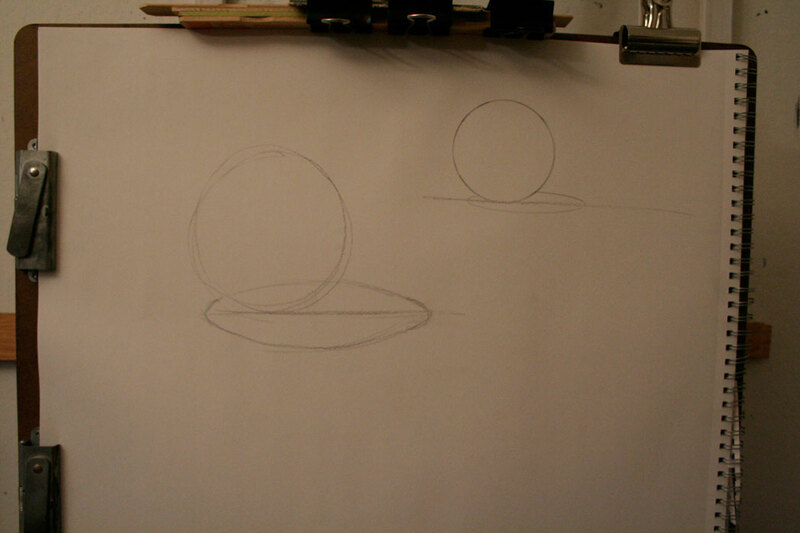 Here's an airbrush diagram of the sphere that you should use to talk about the individual shapes. I have a PDF that you can download of the basic shapes to print out and draw here. 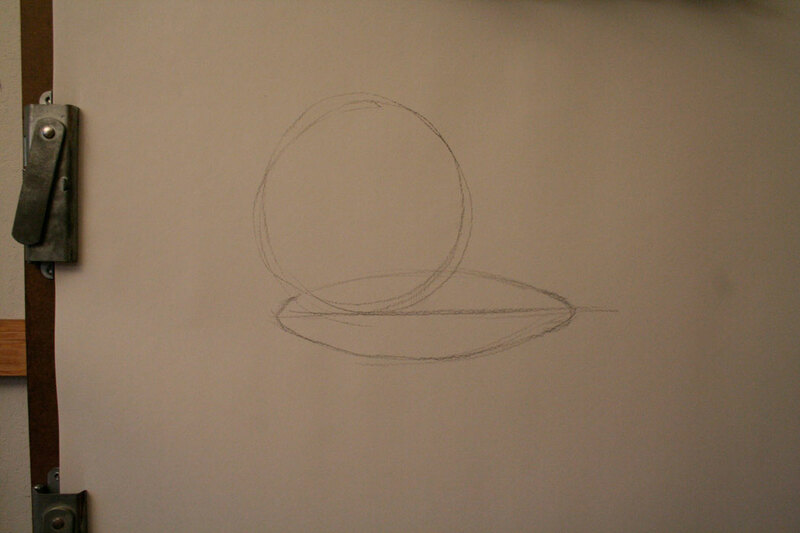 The horizontal line off the bottom is designed to give me a line to draw the elliptical shaped shadow. 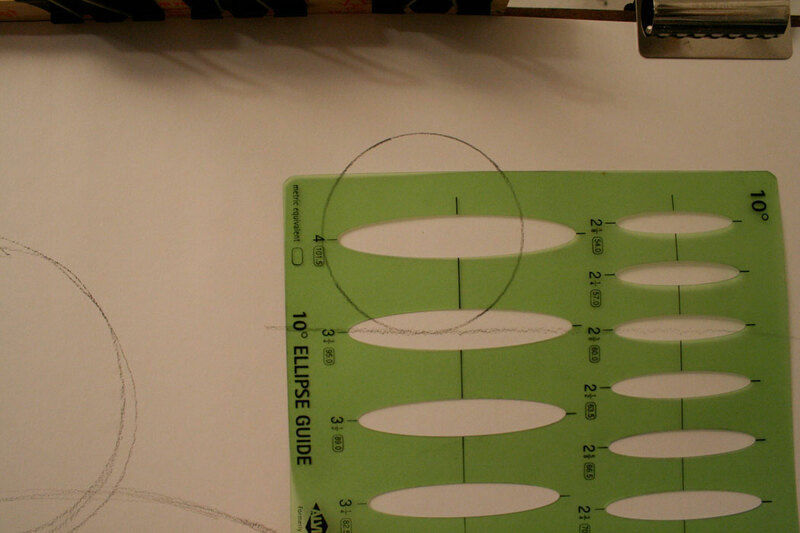 I put brackets on each end of the horizontal line so that the edges of the ellipse will look better. 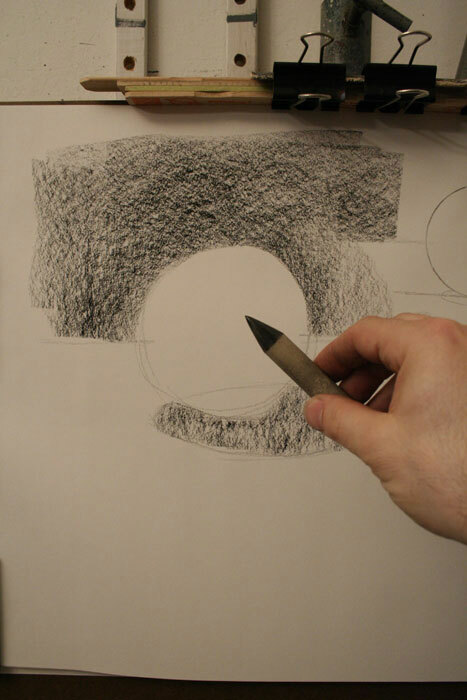 Then I connect the arches. 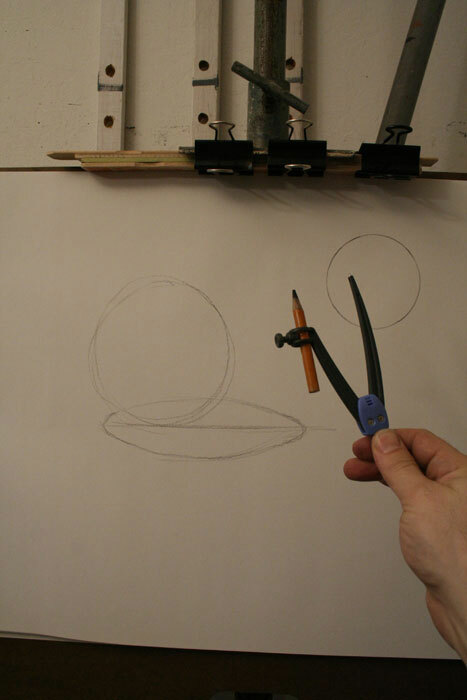 A better way! 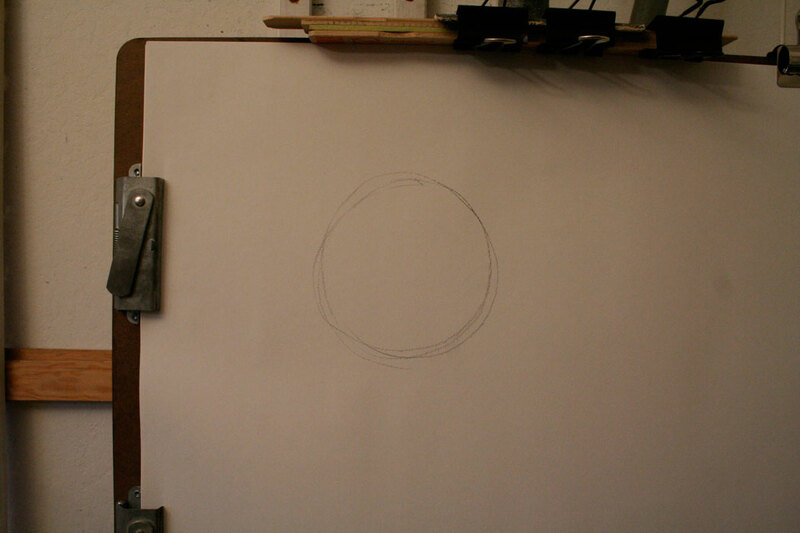 Using a compass to draw the circle! 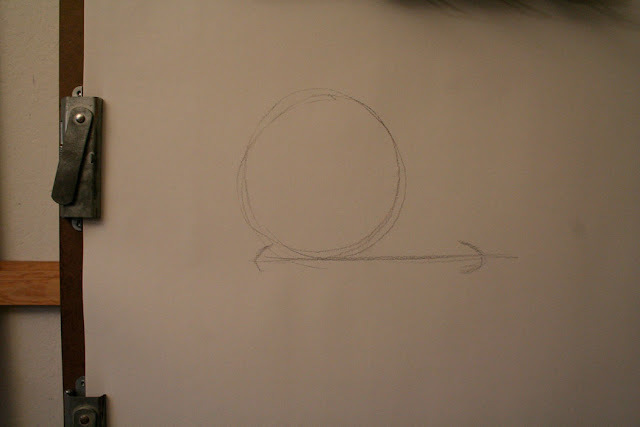 This is called and ellipse guide. 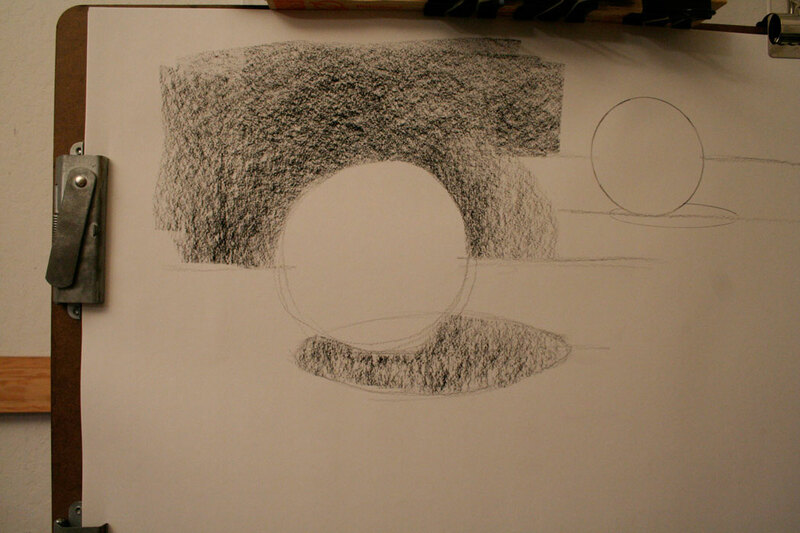 You line it up with the horizontal line that I used as the shadow guide. See how much nicer drawing guides can make it? I'm still gonna use my freehand drawing though. 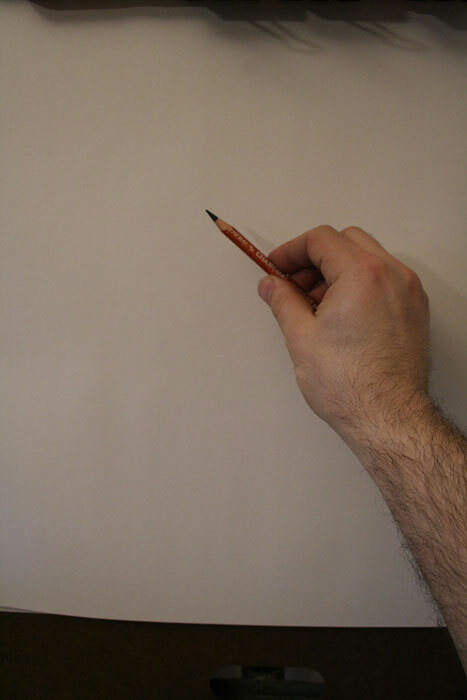 Just keeping myself honest! 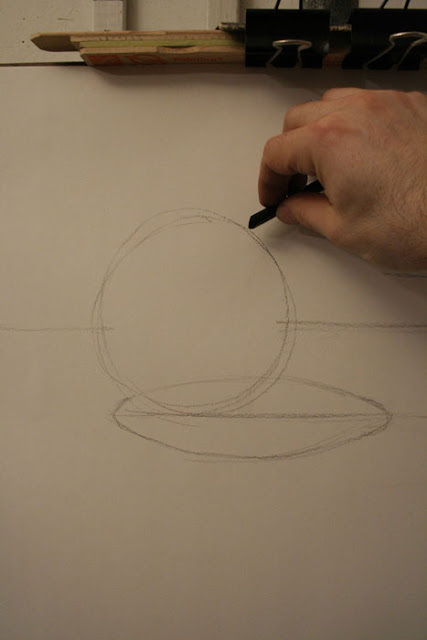 Drawing the back of the table in. 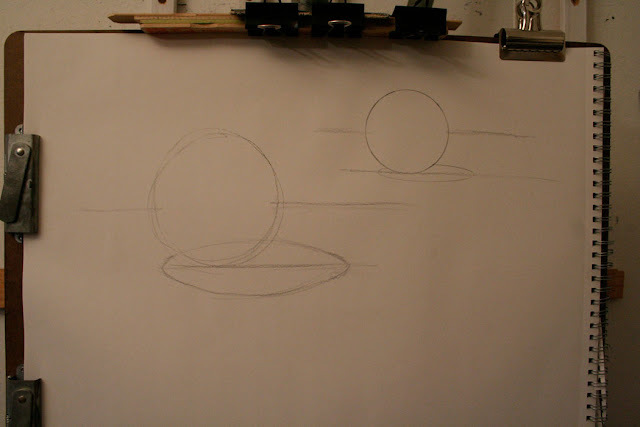 Shading in the background in big swoops. 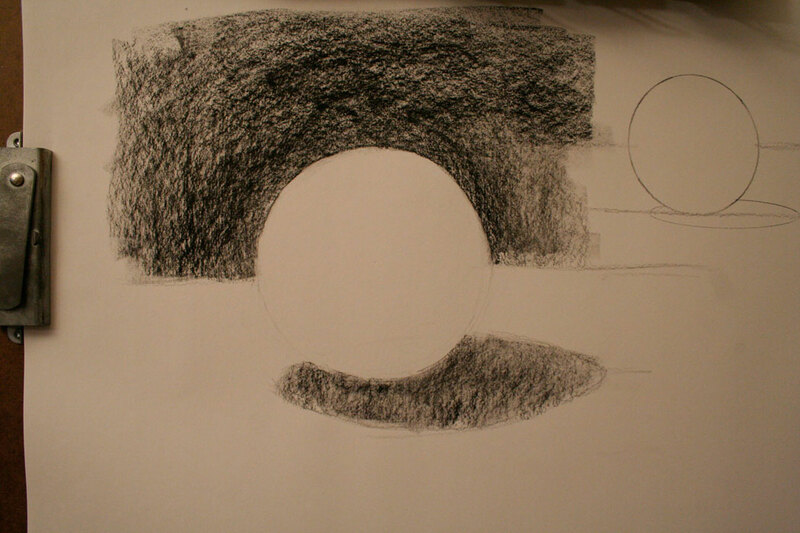 Next I move on the the cast shadow. 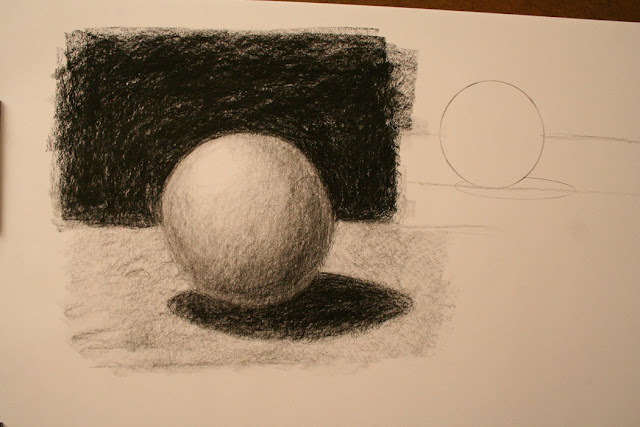 Using a stump to even the tones out. 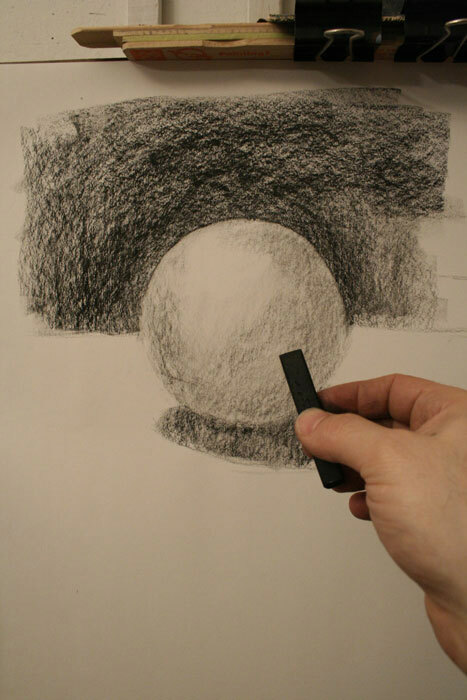 You don't have to but it sure does help! 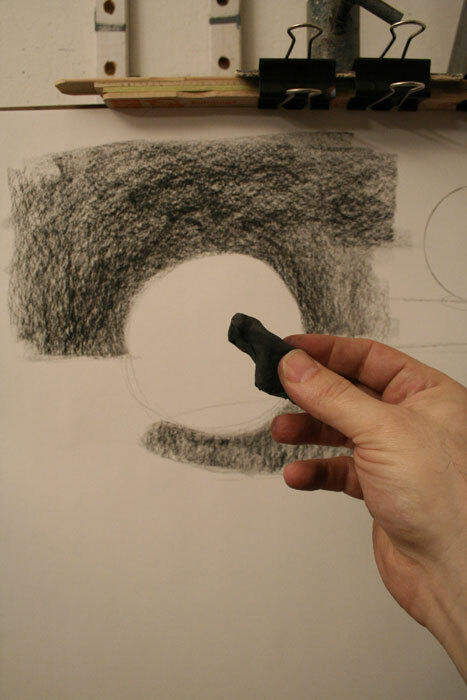 A kneaded eraser that you can use to clean up edges. 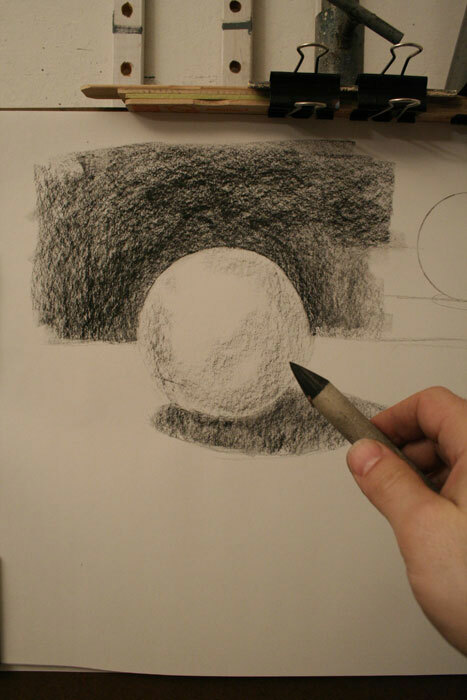 You can even use it to smudge and graduate the transitional tones and shading. 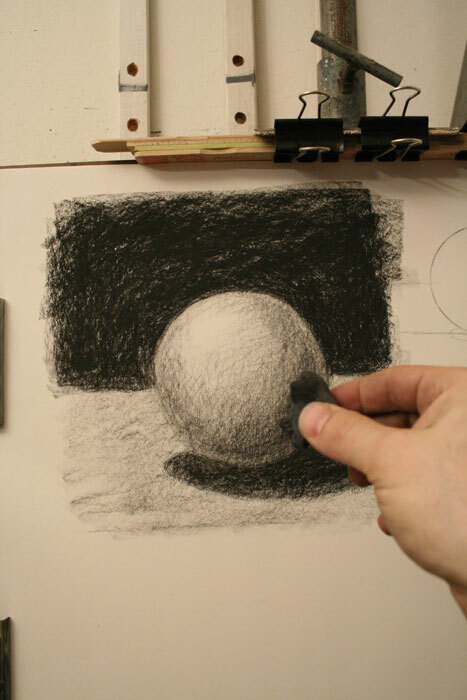 I call the "much kneaded eraser." 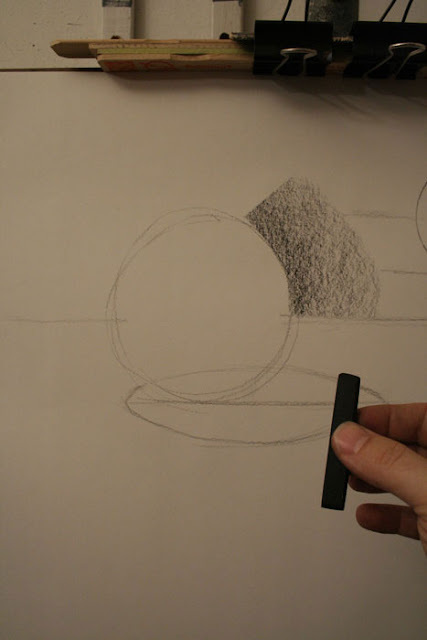 Adding the middle tones of the sphere. 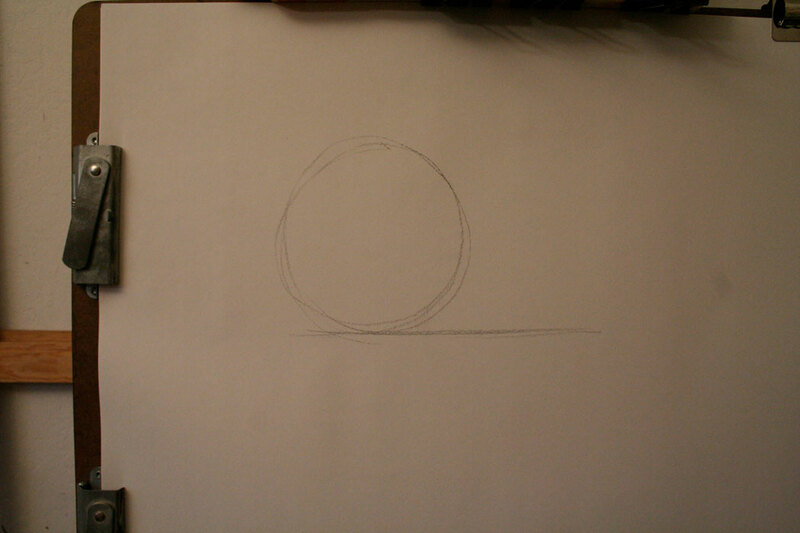 Now I'm stumped. 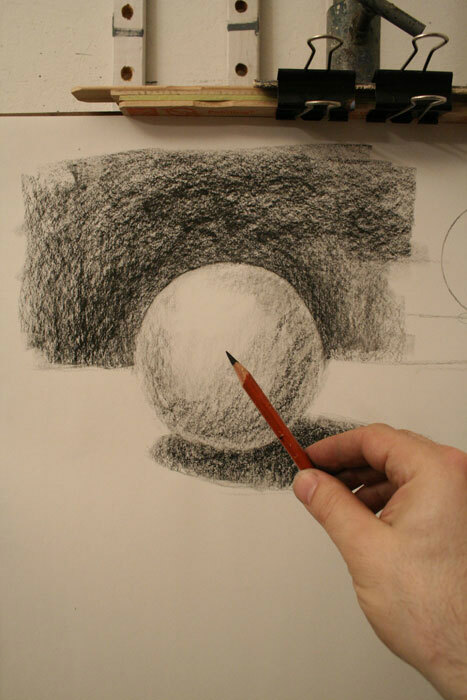 Time to even some tones out. 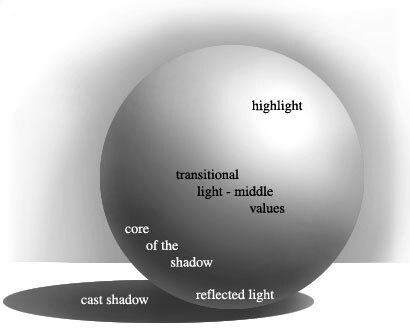 I also use it on the cast shadow. 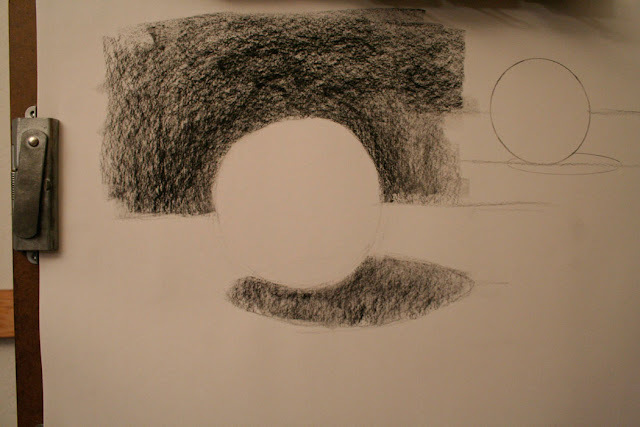 Going back to the large piece of compressed charcoal to rework the whole drawing. 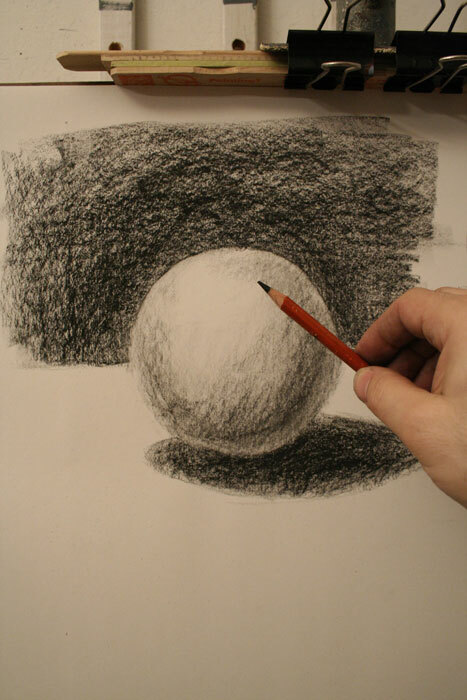 It's a good idea to think of the drawing as a complete entity and work the whole drawing as much as possible. 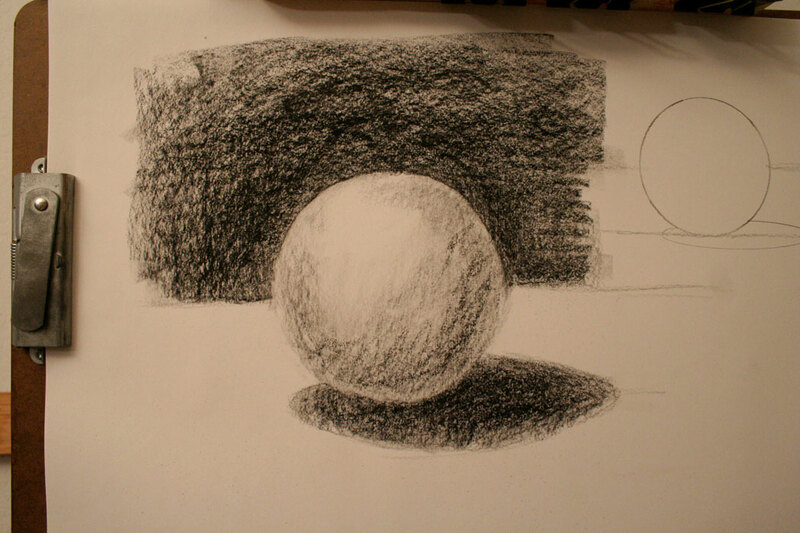 Think about how one value or shade relates to the others. Developing the drawing in a bit more depth. 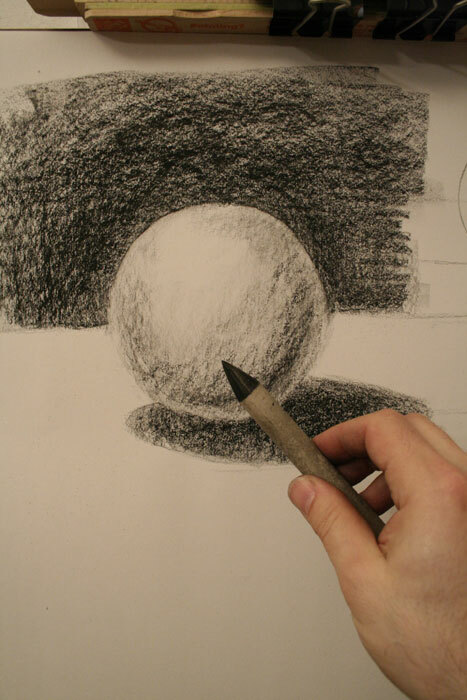 Now I use a smaller charcoal pencil to redefine edges and fix the drawing. I need to make the shape more accurate. 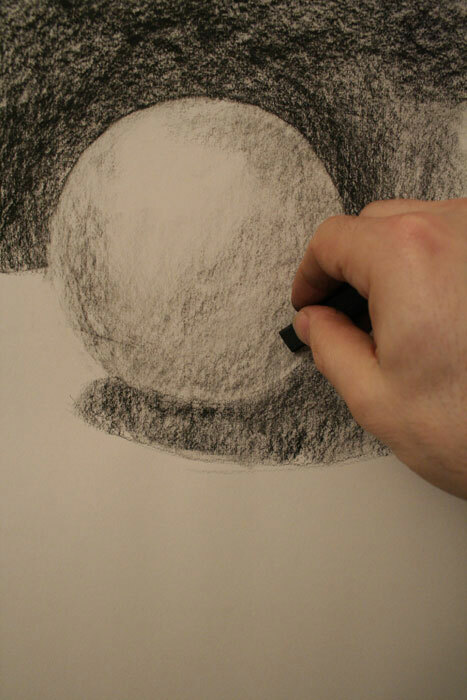 The reflected or ambient light on the sphere is too bright so I'm going to have to dirty it up and reduce its value by stumping and smearing in that area. 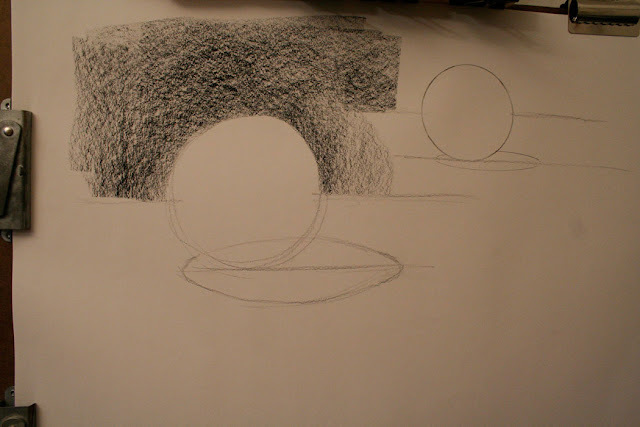 Next I go back in with the pencil and do a sort of glazing and medium tones by cross hatching light scribbled or hatched lines across the forms. It's a way of developing value structure and making a series of marks that make the drawing a little richer and more interesting. 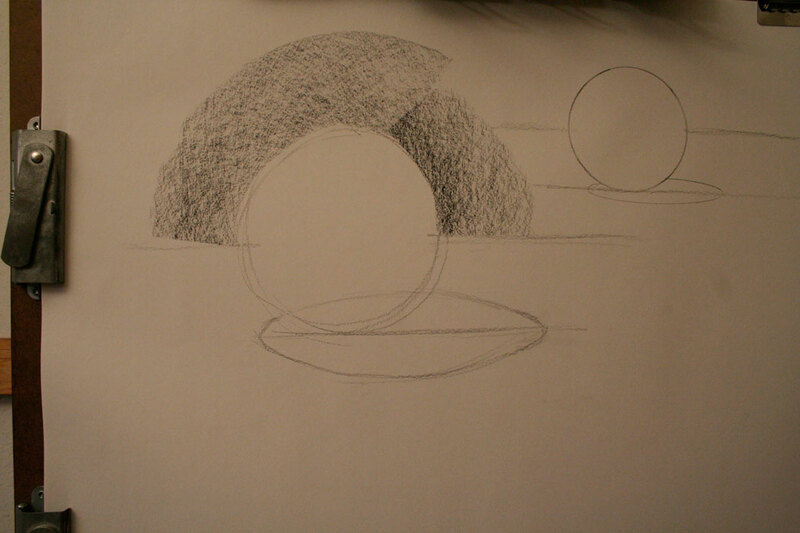 Next darkening the background to develop more of an edge for the sphere. More tone on the table top. 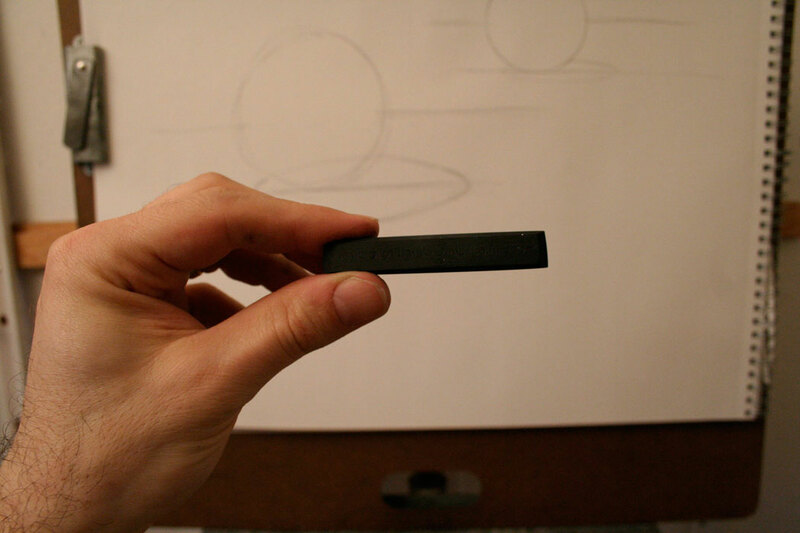 Working out more tones and using the kneaded eraser to smooth transitions and smudge.